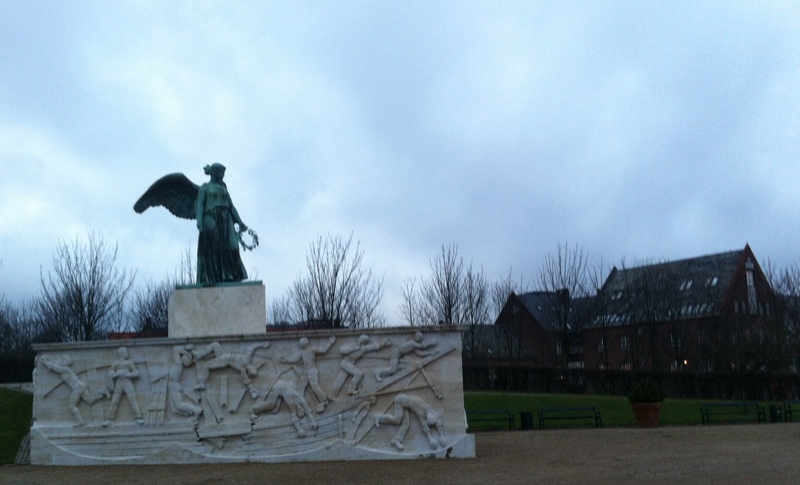 Now back in the US for a few days, I’ve been reflecting on my top five Copenhagen highlights. Sure, there are scattered palaces and castles, museums and theaters, but those are everywhere. They’re hardly even a story, and why else would you be travelling? Here are the five attractions that’ll leave your friend’s jaw on the floor. The “Our Father” elevator in the Danish Department of Agriculture building (Axelborg building) is worth a roundtrip intercontinental ticket in and of itself. Across from Tivoli, walk through the two sets of doors between all the souvenir shops during normal business hours (open late on Wednesdays as a choir will serenade your ride) and be amazed. I’ve given too much away already- just know that you will not be disappointed. 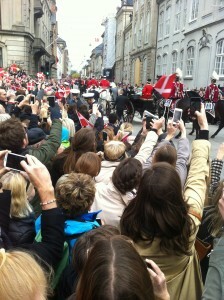 Play the piano on top as hard as your fingers can and perform for all the Danish aggies with some beautiful acoustics. “The best 15 minutes 40 kroner can buy you!” That’s not their slogan, understandably. But there is some truth in that. The cisterns used to hold the drinking water for Frederiksberg, a town that is more like a neighborhood just northwest of the Copenhagen city center. Taking a bus to the zoo is an easy way to get here, and then simply turn around and look in the park behind you for a glass pyramid. 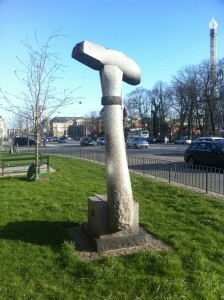 Walk in and enjoy the most interesting museum/art gallery you can find in Northern Europe. It’ll be a quick but worthwhile visit. 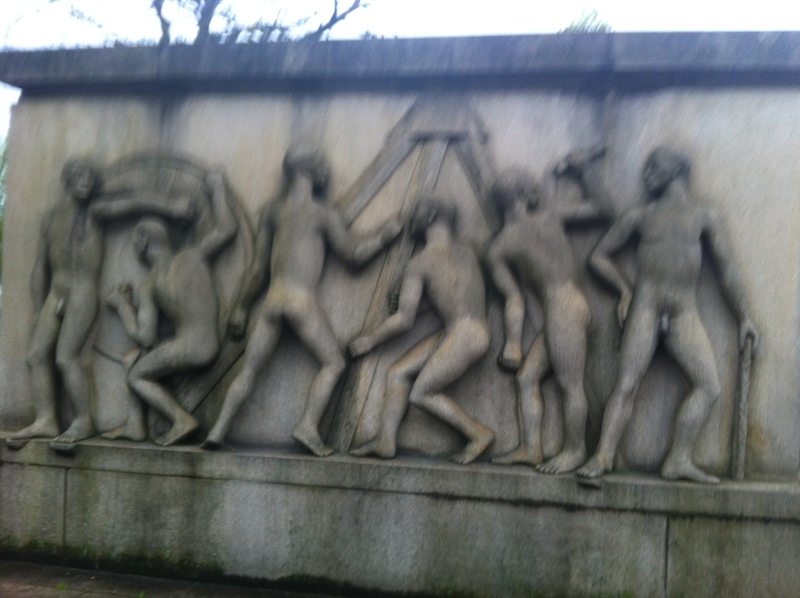 Near there is also an expansive park, palace, and of course the Copenhagen zoo. If on bike, abandon all other plans in order to bike across the “cycle snake” near the Fisketorvet shopping mall adjacent to the Dybbolsbro train station. Luscious, seductive, and irresistible are not usually words used to describe a bridge, but this one deserves them and more. Both sides of this south harbor area are filled with interesting modern architecture, and this is just one example worth seeing even if on foot. Every Tuesday at 8pm, the church attached to the Round Tower (a more well-known tourist attraction along the walking street) opens up for a free candle-lit concert. Sleeping pads and blankets are handed out and viewers sit and lay on the church floor as a few bands come on and play calm-ish music, interspersed with a nun coming up to the stage and saying something religious-y in Danish. Otherwise it doesn’t feel like a religious event, just a chance to hear interesting music in a sweet venue. Lasts about two hours. 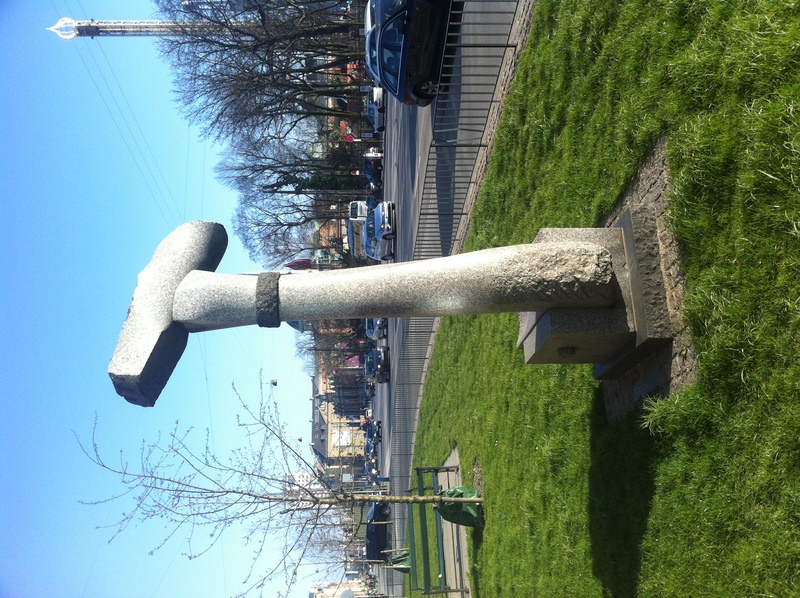 Superkilen park in Norrebro: an interesting urban park in a Copenhagen neighborhood. If stoked on that, check out banana park for a smaller but also neat urban park nearby. Grundtvig church: Also in Norrebro, an expansive and sparsely decorated cathedral. Never got to try this out myself but I imagine there’d be some good echoes in there for some yodelling. This entry was posted in Uncategorized on June 2, 2015 by Andrew Reckers. Time is a hot commodity for current DIS students, as the end of the semester rapidly approaches. That truly unenviable time when one must decide to maybe figure out how to pronounce the town they live in or else just focus on seeing their 25th European country of the trip. Talk to an actual Dane or simply extract culture from another can of Carlsberg? It’s around this time that students begin developing a bucket list of sorts, and I’ve tried to make my own as realistic as possible: co-opt a current controversial political campaign into a list of basic demands that will improve life, liberty, and the pursuit of happiness for a future crop of DIS-ers. I’m pretty sure I was just trying to take a mirror selfie at the time, but turns out that slogan is a bit shocking. 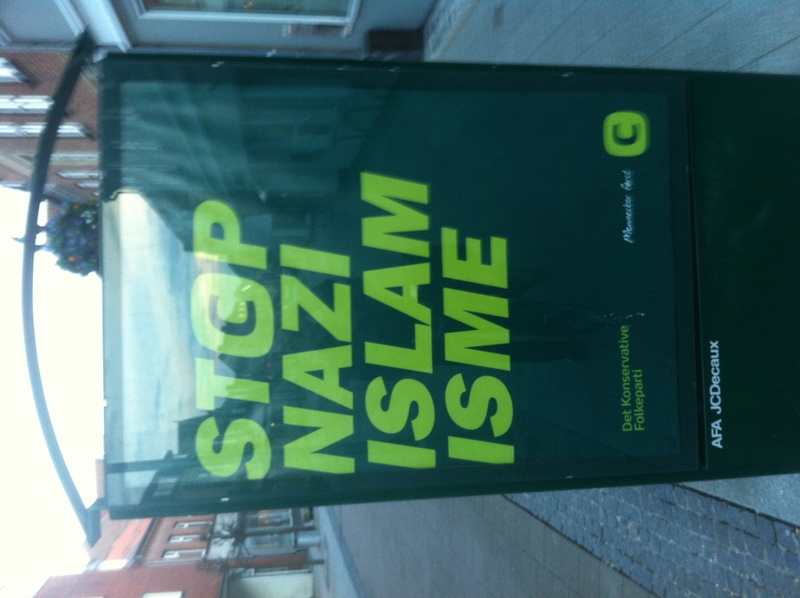 ”Islamisme” is simply the Danish word for Islam. This campaign is run by the Conservative Party, and is just part of a whole set of ”STOP” advertisements. It literally translates to ”STOP HEART LOOSENESS”, which is actually getting at a desire to move away from systematic bureaucracy and into letting people (”hearts”) make decisions. In the end, it just seems like quite the ambitious task and if there is anything I have learned in Denmark, it is that ”small is good”. 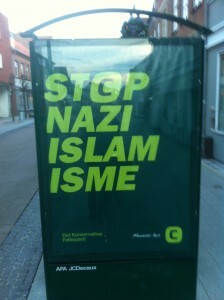 I believe it is my role to change Danish society from the ground up. It won’t be easy and it won’t be without roadblocks, but I strongly believe that a brighter future lays ahead for Denmark if they follow my lead. The little green man runs the lives of every Queen-loving Dane. He alone controls when, and sometimes if they will cross the street. There he is. And in four seconds, he will be gone. But guess what, Danes. When you stand in front of a one way, one lane alleyway and can see to Sweden in one direction and Germany in the next, it’s okay to cross when no cars are approaching. This one will likely not be solved in my lifetime, as I’m sure countless other righteous jaywalkers have tried and failed before me. Regardless, the dark angel looks pensively across her gray yet happy nation. This entry was posted in Uncategorized on April 30, 2015 by Andrew Reckers. 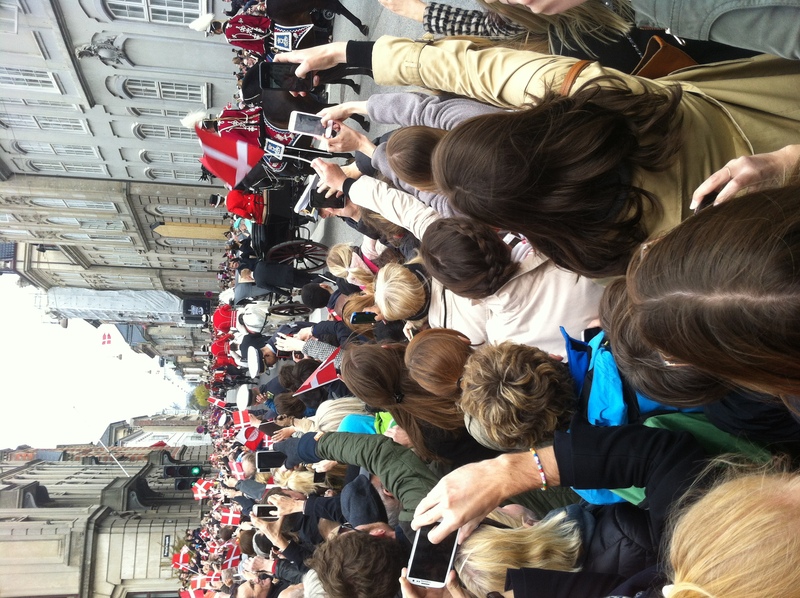 she was paraded through Copenhagen to the City Hall, where she was treated to an event not dissimilar from a high school band concert inside the building, as it was being live streamed to the peons out front. An hour later and she on the balcony waving once more to her kingdom. The onlooking Danes were respectfully muted, perhaps thinking of their own parents and grandparents of advanced age who do not take well to a lot of ruckus. 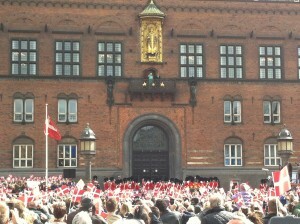 The sound of waving plastic Danish flags was the dominant noise, performed dutifully by nearly all in attendance. 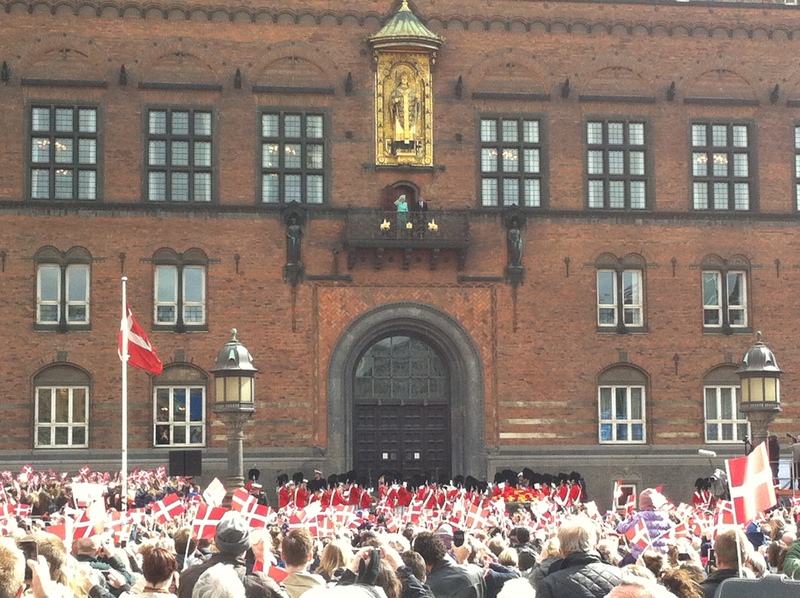 Queen Margrethe was born 75 years ago today, and just a week ago Denmark celebrated another monumental, while a bit more sobering, 75th anniversary. On April 9th, 1940, 40,000 German troops entered Denmark at 4:15am and had the country occupied in fewer than four hours. This was a dark time for Denmark, but Margrethe’s birth a week later brought some optimism into the newly-occupied country. 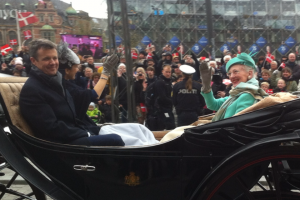 A Danish man at the birthday celebrations today told me that Margrethe’s grandfather, Christian X, rode through Copenhagen daily during the Nazi occupation, reassuring his people that Denmark still belonged to the Danes. Today Margethe does not have to deal with such challenges, but it was nice to see how her birthday can incite such national pride and likely some creative playing hooky stories. 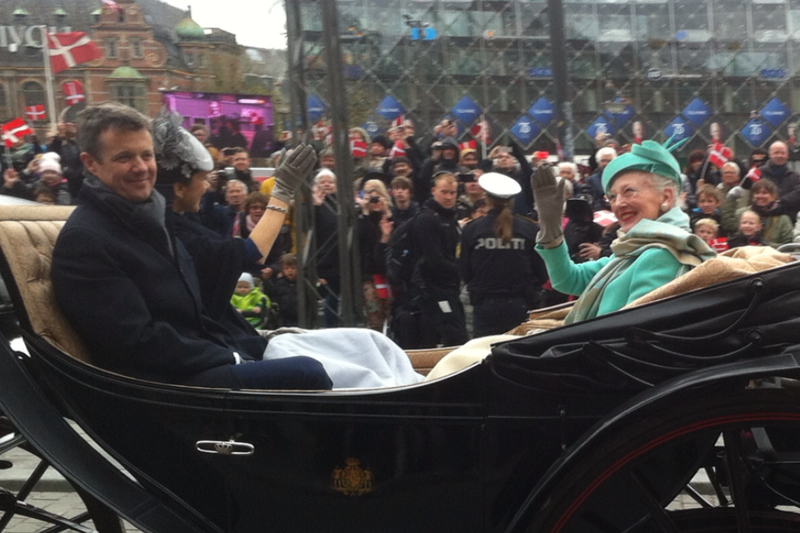 Here she is up close, with her son Frederik (the next King of Denmark) and his wife Mary. This entry was posted in Uncategorized on April 16, 2015 by Andrew Reckers.